The Art In You: FREE Art N' Stuff First Giveaway..more to come! FREE Art N' Stuff First Giveaway..more to come! Is this were we sign up? If so, I'm in. Saw this beauty in person and loved it! Look at all your cute cupcakes on your blog wall paper!! love that you are doing this Jackie! I will share! Wow how generous of you to be doing these give-aways Jackie! I am crossing my fingers and toes for this one! I just LOVE it! How adorable! I just purchased a bunch spice jars at a garage sale and am looking for inspiration. . . thanks! Yours is supreme! OH! me me, pick me!!!! lol! Please enter me in this wonderful giveaway! I would LOVE to win this little sweetie!!!! Your altered bottle doll is splendid. How generous of you Jackie. 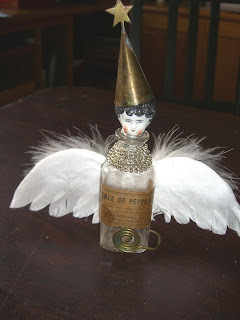 It would go so well with my other altered art dolls. Thanks for the fun giveaway. Please count me in. OMG! My mouth just dropped wide open!!!! This is fantastic!!!!!! This is one amazing giveaway! a pleasure to win this. Ok you know me and those dolls....but she is rather cute with her hat and all. You are too clever Miss Jackie! You are tooo funny I am always behind too and "promising things that I "think" I can get done a lot faster then it really takes!! love the doll!!! I love altered bottles and this one is awesome! Please enter me in the drawing! Thank you and have a great Sunday! Your dolly is so cute with its snuffer head. It made me happy to look at it!!! I love what you're doing...it's very special. And you are so creative...I just love your new doll. Thanks for my gift for winning the last Giveaway. 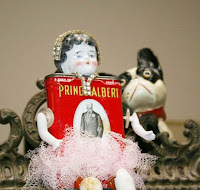 Just love the "Beachy Sirens Sardine Can...it's a real treasure. This one is a cutie. You are so talented and thank you for sharing. p.s. since your into dolls, I have several DOLL magazines I will give you to add to your new Studio. Wow! Jackie, I think that is so generous of you. Anyone would love to have a piece of your art. Thanks for the chance. What a nice give-away prize! May the random generator give-away gods be with me *hee hee*. I went to Retro Cafe because of you...finally...a lot of German Scrap that isn't gold! I find some silver here or there...but soooo little! Of course there was also the rose-colored scrap(for those of us who have lost our rose-colored glasses...still looking). 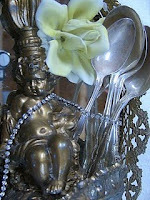 Really enjoyed your art trade...wishing that our paths had crossed more at the retreat...enjoying the blog. 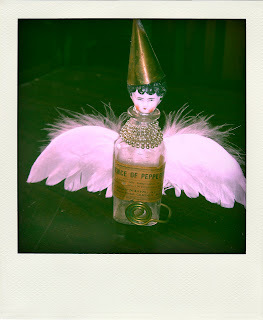 I love contests...hope your lovely little doll angel finds a good home! Note to Self "Start Creating!!" FREE Art N' Stuff Second Giveaway...more to come! It's another Dolly (Kitty) Day?